Welcome back to the 2012 Artisan Design Team Blog Hop! Today, we finish featuring our winning entries for the 2012 Artisan Design Team Contest with my last scrapbook page. If you are following the hop, then you probably arrived from Jeanna Bohanon's blog. In addition to a slightly embarrassing picture of me, she showed a really cute party ensemble made in My Digital Studio. Be sure to check it out! We've been featuring our winning projects for 10 days straight. Here is my tenth project for the hop, the third of three scrapbook pages that I submitted. I love this picture of my dog Monty. He's usually sleeping on my dark brown couch, which makes it hard to get a good picture of a black dog. But, when it's hot out then he lays on my wood floor. The day I took this it was sunny out, and there was really great difused natural light coming in from the window. The journaling talks about the fact that sometimes when he sleeps, he dreams and you can see his paws moving and him running in his sleep. I imagine that he is chasing squirrels and rabbits and birds...oh my! So, I made some little dream scenes with those animals. I used MDS to get the cloud shapes. Then, I drew landscape lines onto white cardstock, stamped the animals above the lines, watercolored the animals, trimmed around the top edge, glued them to the clouds and then trimmed the bottom edge to match the clouds. Then, I paper pieced pieces of grass in various green patterned papers along the same landscape line and trimmed along the bottom cloud edge again. Here is a close-up so you can see the critters. My 2012 Artisan Design Team Monthly projects will be posted on the 4th Monday-Tuesday of each month, so look for those beginning on August 27. And, Stampin' Up will be featuring another batch of projects on Facebook late each month. Now, on to the next stop on the hop with Sarah! Thanks for stopping by. Welcome back to the 2012 Artisan Design Team Blog Hop! Today, we continue featuring our winning entries for the 2012 Artisan Design Team Contest with another card. If you are following the hop, then you probably arrived from Jeanna Bohanon's blog. Didn't you just love her project! She does some amazing things with My Digital Studio. We'll be featuring our winning projects for 10 days straight. Here is my ninth project for the hop, the fifth of five cards that I submitted. It doesn't look very fancy at this point; looks like a basic Happy Birthday card. But, if you open the flap of the little envelope and pull on the orange semi-circle, then you see the following. Now it looks a little cuter! I used the petite pennants builder punch to make the banner, strung it on the white thread, and anchored the start of it inside the envelope using a circle of cardstock glued down. To put it in the envelope, I just folded the pennants back and forth together to make a stack, and kept the pull thread outside the envelope. It's hard to see in this picture, but the green banner has the word birthday stamped on it repeatedly. And now, the inside of the card. I repeated the pennants, but in a simpler format. Also, I used the word window punch and stamped the greeting through it onto the white background of the card. A little pen stitching with the white gel pen, and it was good to go! Welcome back! Today I am sharing the second part of my Artisan Design Team projects for August, 2012. First I have a scrapbook page to share. This started off with some inspiration from Pinterest. I loved the title on this page. Hanging letters...how clever! I wanted to use that for my title, wanted to feature Gumball Green and had a set of happy pictures of my friend's daughter. And so, my page was born. I actually played around with the layout in MDS to see where I wanted to put the pictures. Also, this was the third draft of the layout that I finally made. Here were the two sketches I started out with. The first one had banners down the left side, and used three larger photos stacked vertically. I will probably use this again in the future; I think it would make a great birthday page! The second one was close to what I created, but in the end I decided to line up the photos across the bottom edge on a single matt instead of individually matting them and skewing their placement. So, here is the page I created. I used the In Color Designer Series Paper Stack using the Gumball Green text print, the Raspberry Ripple elegant print and the Summer Starfruit polka dot print. I layered all of the pictures on a large piece of the Gumball Green, and added strips of the other two with pointed ends to match the banners. I also diecut lots of banners from the patterned papers. I lined them up above the letters, and then adhered them all down. Then, I used the paper piercing template to make lines, stitched them with white Baker's Twine and added a french knot when I got to the letters. (The piercing template and the letters I just received as part of my $500 shopping spree! I'll post more about that later.) I added some of the Raspberry Ripple Stitched Satin Ribbon and an In Color Dahlia to finish it off. I did the journaling in My Digital Studio, and printed it on vellum cardstock which is adhered over a block of Whisper White. So, I decided to take three of our In Colors, and make rows of scallops from various materials and vary the coloring from light to dark. I used the Tasteful Trims die, and the large scallop pattern on it. The bottom two rows of each color is cardstock that I rubbed along the edge of my table until it separated into two layers which I pulled apart. The second two rows of each color is white denim that I died with the Stampin' Spritzers using a mixture made of alcohol and reinkers. The top two rows of each color are vellum cardstock, and I sponged ink across them lightly. I stitched each row down on a Naturals White paper background. The paper flower was also died usin gthe Stampin' Spritzer's in Summer Starfruit, and I cut two layers of the largest flower on the Fun Flowers die out of a Summer Starfruit print in the ___ Designer Series Paper. I stamped the Layered Frame image in Summer Starfruit, and then in Midnight Muse which I punched out with a 1" circle punch. I also used Gumball Green Stitched Satin Ribbon to tie under the flower and left the ends long. Here is a close-up of the Create flower/badge. And, I have one more bonus project! I know there are varying opinions about Summer Starfruit, but it really is an In Color. I see it popping up in lots of craft designs including patterned paper and home decor items and fabrics as well. One of the projects I saw used Summer Starfruit along with gray and black, and I really thought the combo was striking. So, I set out to create a card with that in mind. Here is what I came up with. The gray hexagon pattern is from Twitterpated Designer Series Paper, one of my favorite paper packs. The Summer Starfruit text is from the In Color stack. The black and ivory is from the Timeless Portrait fabric. I tied it around the card, knotted it and notched the ends. Then, I created a layered flower to put over the knot. I punched a 1/2" circul from the gray patterend paper for the center, and layered it with clear gems. Then, I stamped the greeting with Basic Black on Naturals White, and die cut it with the Bitty Banners dies. Both the flower and the banner are popped up with Stampin' Dimensionals. That's all for my August Design Team projects...almost! There are 10 more projects that Stampin' Up! shared today over on their Facebook page (one from each of us!). Go check them out! Thanks for visiting. Welcome back to the 2012 Artisan Design Team Blog Hop! Today, we continue featuring our winning entries for the 2012 Artisan Design Team Contest with another 3D project. If you are following the hop, then you probably arrived from Jeanna Bohanon's blog. Didn't you just love her project! She does some amazing things with My Digital Studio. We'll be featuring our winning projects for 10 days straight. Here is my eighth project for the hop, the second of two 3D projects that I submitted. This was another really fun project to make. If you look around Pinterest and lots of the craft magazines, you will see lots of these frames with wire and things pinned to them. I decided to put three groupings of photos of each Grandma and my Mom. So, the top row is my Maternal Grandma, the second row is my Paternal Grandma and the bottom row is my Mother. I also tried to include pictures from their childhoods as well as when they were young adults. I layered the pictures on neutral paper, and sponged all of the edges to age them. I also diecut some doilies, stamped the doily set, cut the specialy Designer Series Paper with doiles apart and then layered these doiles in groups behind each photo. I made a chalkboard looking background and typed each of their names over it in My Digital Studio, punched them out, layered them on the same neutral paper and sponged those edges. So, each row has one of these titles. And, last but not least, I cut strips of fabric, applied them to the Big Shot adhesive sheets, cut smaller pieces, notched the ends, and then folder them over the wire and stuck them together. Then, I added the photo groupings to the wires with the mini clothespins. Welcome to my Artisan Design Team projects for August, 2012! Stampin' Up! 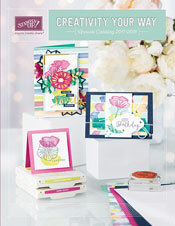 sent me a box full of In Color 2012-2014 products including ink pads, markers, Designer Series Paper, ribbon, etc. to feature this month. This is the first card that I made. I decided to stamp the largest frame from the Layered Labels set in Primrose Petals on Shimmer White paper, and used a Blender Pen to shade the stamped image. Then, I stamped again in Raspberry Ripple ink on Primrose Petals cardstock, and shaded again with the Blender Pen. Then, I colored the greeting from the middle, stamped on Whisper White paper, and trimmed it into a banner shape. Then, I layered them with Stampin' Dimensionals. I cut some more Primrose Petals cardstock with the beaded border from the Tasteful Trims die, cut it in half and used it as a scalloped border for a couple of layers of Designer Series paper. Some Baker's Twine, and it was good to go. This card will fit in a standard A10 envelope. My next project is actually two! I made an anniversary card for my parents' 50th Wedding Anniversary, and also a matching gift bag to go along with it. I used the Daydream Medallions to stamp the largest medallion in Summer Starfruit onto the gift bag. I then used Raspberry Ripple to stamp the next largest medallion on Raspberry Ripple cardstock, and diecut the image out. Next I stamped in Versamark the frame from Layered Labels on Summer Starfruit cardstock, and embossed with white embossing powder. Then, I diecut the image. I have to say I really LOVE have open framed dies that match our stamp sets. It's so easy to stamp and then cut out the image! Next, I used the Raspberry Ripple marker to color the greeting from the center of the frame, and stamped onto Naturals White cardstock. I cut it into a thin strip, folded the ends under, and adhered it to the Summer Starfruit frame. All the layers are popped up with Stampin' Dimensionals. Below that I made a small banner and hung it from white brads that I added to the gift bag. It uses the smallest medallion stamped in Summer Starfruit and punched out, the greeting added in Raspberry Ripple over the top, and some banners diecut with the Bitty Banners Framelets dies. Then I sewed the four pieces together on my sewing machine. The card is pretty much the same process, except that I added Raspberry Ripple ribbon to the front of the card and ran it through the ends of the Summer Starfruit frame tieing it into a bow. The card is standard size, 4 1/4" x 5 1/2". So, wondering what the inside of the card looks like? I'll show you. I added another frame cut in half and another banner tied to the white brads. To send the card, I can just tuck the banner into the center of the card. Tomorrow, I'll be sharing two more projects, including a scrapbook page and a frameable art piece. I hope to see you here tomorrow. Thanks for visiting! Here is my seventh project for the hop, the fourth of five cards that I submitted. I tried a few different things on this card. I love Washi Tape, and have seen a couple of tutorials about how to make your own using various supplies including stamps. So, I took the white waffle paper that we sold, cut a strip, applied it to the Big Shot Multi-Purpose Adhesive Sheets and then stamped the border stamp from this set in brown ink on the paper. I then trimmed it to be about the width of the border stamp image. I spritzed light pink patterned paper from Beau Chateau with the Blushing Bride Smooch Spritz. I also spritzed the stamped flower with Vanilla Shimmer Smooch Spritz, trimmed different layers from different stamped flowers and layered them with Stampin' Dimensionals. I also added the Cherry Cobbler Dazzling Details to the center of the butterfly body. Here is a closeup of the details on the front. Welcome back to the 2012 Artisan Design Team Blog Hop! Today, we continue featuring our winning entries for the 2012 Artisan Design Team Contest with another scrapbook page. If you are following the hop, then you probably arrived from Jeanna Bohanon's blog. Didn't you just love her project! She does some amazing things with My Digital Studio. We'll be featuring our winning projects for 10 days straight. Here is my sixth project for the hop, the second of three scrapbook pages that I submitted. This was a fun page to make is it gave me a chance to tell a funny story about my family. We often travel to the Rocky Mountains, and many times to Rocky Mountain National Park in Estes Park, Colorado. It seems that every time we take a picnic lunch to cook and/or eat, the clouds and rain decide to arrive. Over the years, we have had to employ many tactics to avoid the rain and storms. One year, we sat in the car while Dad put aluminum foil over the grill covering it from the rain and waiting for the food to cook. The year pictured on this page, we were able to complete the cooking and most of the eating before we had to pack up and hurry to the car. This day turned into a stormy day complete with lightening, so we couldn't stay outside any longer. If you look closely at the picture in the upper right, you can see my brother with a wrinkled face looking up at the gathering clouds! This story was the first thing to come to mind when I saw that red patterned paper that looks so much like a picnic table cloth! I changed my pictures to black and white so the colors wouldn't clash with the colors of the paper and elements, and I like the way it helped keep the focus on the photos. Welcome back to the 2012 Artisan Design Team Blog Hop! Today, we continue featuring our winning entries for the 2012 Artisan Design Team Contest with a card. If you are following the hop, then you probably arrived from Jeanna Bohanon's blog. Didn't you just love her cute owl card! So adorable. We'll be featuring our winning projects for 10 days straight. Here is my fifth project for the hop, the third of five cards that I submitted. I loved this kite set. It was in the previous mini catalog, and I'm a little sad that it didn't make it into this year's main catalog. At least we have the happy balloon set! Plus, my original Stampin' Up group name is Windy City, so I'll be making some scrapbook pages in the future with pictures of group events using this set. Here is the inside of the card. I like it almost as much as the outside! I never thought to decorate the top inside of a card, but it looks really cool with the kite especially. Now, on to the next stop on the hop with Sarah for a cute scrapbook page! Thanks for stopping by. Welcome back to the 2012 Artisan Design Team Blog Hop! Today, we continue featuring our winning entries for the 2012 Artisan Design Team Contest with a 3D project. If you are following the hop, then you probably arrived from Jeanna Bohanon's blog. Didn't you just love her project! We'll be featuring our winning projects for 10 days straight. Here is my fourth project for the hop, one of the two 3D projects that I submitted. I really love how these embroidery hoops turned out. I used My Digital Studio to design the layout of each one. The hoop sizes are 6", 8" and 10" around. I used various Stampin' Up fabrics, ironed them onto the Big Shot Fabric Adhesive Roll, traced the outline of each shape using vellum cardstock and used that as a pattern to cut out each shape. I was originally going to use black grosgrain ribbon to make the various knots, but I didn't have any! So, I tore thin strips of another fabric, and in the end I liked that option even better. It gives them more depth. I ironed all of the shapes onto plain linen fabric, stitched around each shape with a straight stitch and a free motion quilting foot. FYI...I don't have a fancy sewing machine! It's a simple Brother model that I purchased at Target, but it is great for all kinds of crafty projects including paper based ones. So, here are the original layouts that I designed using MDS. I decided to leave the sunshine off since I didn't have any yellow fabric, and the birds I thought were to small to try and piece. Here were the banners. Also, I printed the clouds separately in light blue so it would be easier to trace around them and get the pattern. Welcome back to the 2012 Artisan Design Team Blog Hop! Today, we continue featuring our winning entries for the 2012 Artisan Design Team Contest with a second card. If you are following the hop, then you probably arrived from Jeanna Bohanon's blog. Didn't you just love her project! We'll be featuring our winning projects for 10 days straight. Here is my third project for the hop, one of the five cards that I submitted. I really love how this card turned out. So much so, that I redid it for my Artisan Swap using a current stamp (poppies) which I posted here (the last card on the post). This cards uses the retired hostess set Simply Soft. I love flower stamps! They are by far the type of stamp set that occupies the biggest part of my collection. I did some spritzing with a marker, paper tearing and distressing, watercolor and then added my favorite ribbon, the ruffled edge! My 2012 Artisan Design Team Monthly projects will be posted on the 4th Monday-Tuesday of each month, so look for those beginning on August 27. And, Stampin' Up will be featuring another batch of projects on Facebook on the 20th of each month. You should be able to find the August projects on Facebook now!